There are only two weeks left to vote for your favourite travel rewards credit card! We are closing in on 5,000 votes already and would love to hear from you if you haven't voted yet. Vote here! We added a new loyalty program to Rewards Canada today. Federal Hotels International Gracious Rewards. This small hotel chain from Asia is offering Triple Points for all stays at their Kuala Lumpur and Sydney hotels. Check them out if your travels take you to that part of the world over the next few months. See our Gracious Rewards bonus points page here. Over on our global site we detailed how you can an elite status match with Sonesta Hotels Travel Plus program. 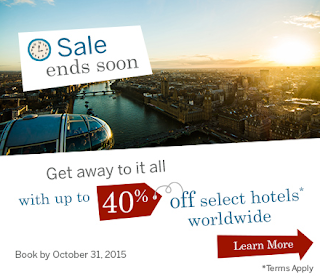 American Express Travel is once again offering their up to 40% off hotels sale. Book by Oct 31 and remember you earn 1 additional Membership Rewards point per dollar spent on all bookings. Find out more here. Etihad Airways has their business class on sale out of Toronto. Book by Oct 31 for travel until Jan 6, 16. Find out more here!